If there is one item from my youth that I treasure, it would be my Black Widow Darts. I was in my third year of Engineering when our dentist, a personal friend of my aunt, introduced me to darts. On my free time, I would hangout in his clinic and between patients, we would play darts. Eventually I got better, and he took me to Manila Cafe and Session Cafe to play with the good players of Baguio City. I won a few tournaments including the first ever open darts tournament held at the then Hyatt Hotel. My Black Widow darts came to me unexpectedly. As I was learning to play darts, I installed a board in my room. Pretty soon, some of the neighbourhood kids came to play. There was this one kid who is quite new in our hood who came to play and brought his own dart. It look scruffy (the darts not the kid) and so we left it alone. It has non-uniform shafts and flights, he used whatever was available. He also didn’t care much about it – leaving it at our home most of the time. One day, Dr. Sabater, came to see my dart board at home and noticed the scruffy set of darts. He recognised it as Black Widow Darts – the most sought after brand of darts. He knew this because he has a set himself. 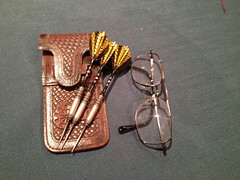 In fact, it was the same set of darts he was using. We put the darts side-by-side and sure enough, the scruffy dart was unmistakably a Black Widow. A proverbial diamond in the rough. The next time the kid came to play – I offered to buy the darts, I don’t know for how much. All I know was that I was feeling guilty after because it felt like stealing it from him for the price I paid. But as soon as it became mine, I went psycho – had the tip replaced, got several sets of shafts to find the best balance, new flights, the works. These darts won me all the championship in my name including that in Hyatt Hotel. As I got better, I’ve longed to have a brand new Black Widow darts. Uncle Ed was still with the U.S. Navy then and would just be to happy to buy me one – if we can find it. Months turned into years, I started working and traveled around the world. I have also stopped competing but always had a special place for my Black Widow. However, every now and then I searched through sports shop looking for one. There were other tungsten darts I bought through the years and they were all just as good, but the heart wants what the heart wants. Recently, my sister had a small re-union with her University friends here in Sydney. They came from all over but mostly from the States and are now very successful on their own rights. They rented several serviced Meriton apartments overlooking an almost 360 degree view of the city. As they were staying over a few days, they bought a dartboard for fun. We were invited to join them for dinner and sticky beak at their great apartments. One of them knew I use to play darts and urged me to have a throw. Both of my daughters were watching when I took 3 darts on my hand – and without hesitation stick 2 out of 3 into the bulls eye to a wild cheer from everyone who saw it. All the guys started taking photos of themselves next to the dart board with the darts still in the bulls eye. I didn’t throw again- as I’m pretty sure I will not be able to do it again. To see the smile in the face of Jessica and Celine who had a hint of pride for their dad was a wonderful feeling. Perhaps it was the spirit of Christmas. While shopping for swimmers, I caught sight of the darts section in Rebel Sports and picked up a set of new shafts and flights. When I reached home, I took out my Black Widow and fitted the new shafts and started to play. I’ve forgotten how relaxing a quiet practice of solo darts is. After a few hours I sat down and realised that in 2013, we don’t really need to travel around the world to search for an item anymore. I opened my eBay app and searched for Black Widow darts and there it was – a brand new one and just a click away. I sigh a deep breath and said why not. Merry Christmas. The shaft of the darts is that replaceable stem screwed to the body of the dart. As you get better, the chances of hitting darts on top of the other increases. It would be like shooting an arrow already on the target and splitting it in the process. However, instead of splitting a dart, you simply ruin the tip of the shaft. Most players carry spare sets of shafts for replacement when this happen.